The index opened weak by a few points but saw huge sell-off after RBI policy statement was announced to close near the lows of the day at 7603.20, huge loss of 155.60 points. The broader market was weak with 435 advances to 1122 declines. The range is at 7400-8000. Call option 7500-8300 added huge 64.86 lacs OI with small short covering seen at 7400 and below strike prices. 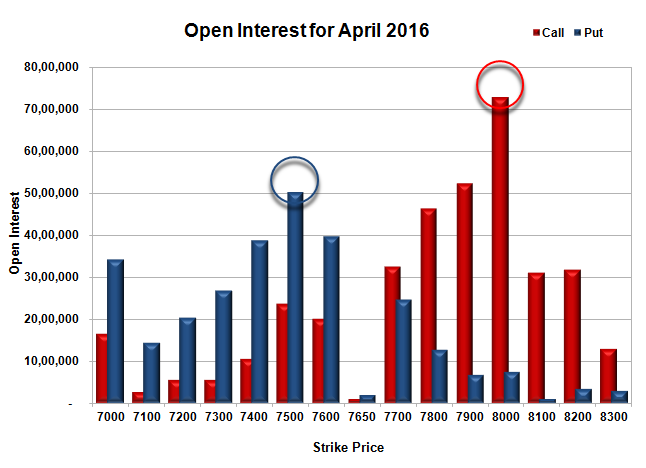 Put option 7600-7300 added 25.13 lacs OI with short covering seen at 7700 and above strike prices. 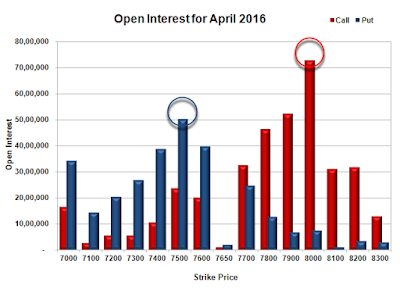 Nifty Open Interest is at 1,78,46,025 down by 9,26,475, with decrease in price, most probably huge long liquidation. 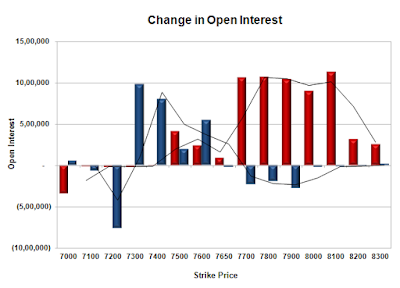 Bank Nifty Open Interest is at 17,71,500 up by 1,33,710, with decrease in price, most probably huge short build-up. FII’s sold huge 22208 contracts of Index Futures, which includes net 13638 contracts long liquidation and 8570 contracts short build-up, with decrease in net OI by 5068 contracts, includes 39032 longs to 61240 shorts for the day. FII’s Index future open contract as on date is 162087 Longs to 81077 Shorts, Net 81010 down by 22208 contracts. Initial support now at 7600, with OI of 39.59 lacs and below that at 7500 with OI of 50.18 lacs. Initial resistance at 7700, with huge OI addition of 10.59 lacs and above that at 7800 with OI of 46.34 lacs. 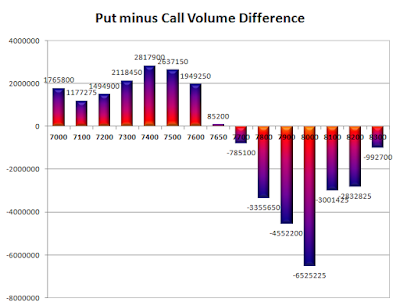 Day Range as per Option Table is 7558 - 7709 and as per VIX is 7532 - 7674 with 7643 as the Pivot.